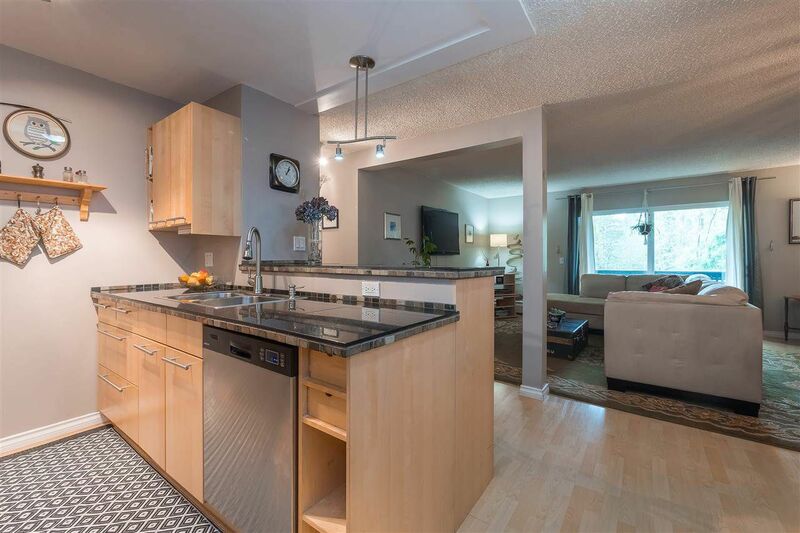 Extremely private & serene setting plus recent updates to this huge 3 large bedroom, 1 full bath CORNER suite include newer kitchen cupboards, appliances & granite countertops! Huge living/dining area with access to the large covered deck (west facing) overlooking trees/greenbelt. Large master bedroom with extra built in closets plus 2 other large bedrooms! Tons of room here plus in-suite storage, indoor pool, exercise rm, bike storage, playground! Tons of hike/bike trails, schools & transit including skytrain-all nearby! Great for student as its 15 min to SFU! Caretaker on site, complex has many updates incl windows, roof & ext paint. Strata fees include heat & hot water! OPEN HOUSE SATURDAY, APRIL 13, 2-4!